Digital infrastructure is increasingly the backbone of prosperous economies, vigorous research communities, strong militaries, transparent governments, and free societies. As never before, information technology is fostering transnational dialogue and facilitating the global flow of goods and services. These social and trade links have become indispensable to our daily lives. Critical life-sustaining infrastructures that deliver electricity and water, control air traffic, and support our financial system all depend on networked information systems. Governments are now able to streamline the provision of essential services through eGovernment initiatives. Social and political movements rely on the Internet to enable new and more expansive forms of organization and action. The reach of networked technology is pervasive and global. For all nations, the underlying digital infrastructure is or will soon become a national asset. To realize fully the benefits that networked technology promises the world, these systems must function reliably and securely. People must have confidence that data will travel to its destination without disruption. Assuring the free flow of information, the security and privacy of data, and the integrity of the interconnected networks themselves are all essential to American and global economic prosperity, security, and the promotion of universal rights. Almost a third of the world’s population uses the Internet and countless more are touched by it in their daily lives. There are more than four billion digital wireless devices in the world today. Scarcely a halfcentury ago, that number was zero. We live in a rare historical moment with an opportunity to build on cyberspace’s successes and help secure its future for U.S. citizens and the global community. For these technologies to continue to empower individuals, enrich societies, and foster the research, development, and innovation essential to building modern economies, it must retain the openness and interoperability that have characterized its explosive growth. Underlying these are technical principles and effective governance structures that demand our support. At the same time, our networks must be secure and reliable; they must retain the trust of individuals, businesses and governments, and should be resilient to arbitrary or malicious disruption. The world must collectively recognize the challenges posed by malevolent actors’ entry into cyberspace, and update and strengthen our national and international policies accordingly. Activities undertaken in cyberspace have consequences for our lives in physical space, and we must work towards building the rule of law, to prevent the risks of logging on from outweighing its benefits. The future of an open, interoperable, secure and reliable cyberspace depends on nations recognizing and safeguarding that which should endure, while confronting those who would destabilize or undermine our increasingly networked world. Free Flow of Information. States do not, and should not have to choose between the free flow of information and the security of their networks. The best cybersecurity solutions are dynamic and adaptable, with minimal impact on network performance. These tools secure systems without crippling innovation, suppressing freedom of expression or association, or impeding global interoperability. In contrast, we see other approaches—such as national-level filters and firewalls—as providing only an illusion of security while hampering the effectiveness and growth of the Internet as an open, interoperable, secure, and reliable medium of exchange. The same is true commercially; cyberspace must remain a level playing field that rewards innovation, entrepreneurship, and industriousness, not a venue where states arbitrarily disrupt the free flow of information to create unfair advantage. 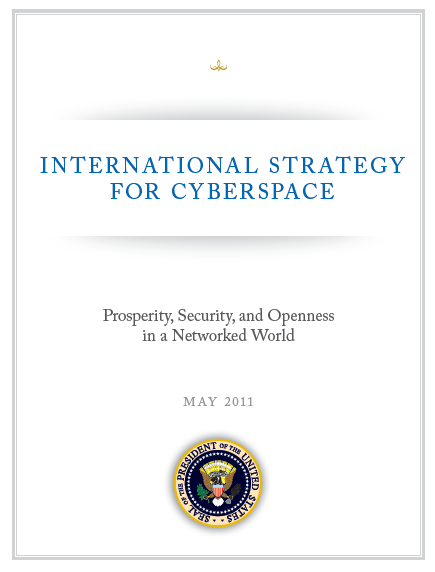 The United States is committed to international initiatives and standards that enhance cybersecurity while safeguarding free trade and the broader free flow of information, recognizing our global responsibilities, as well as our national needs. Too often, such principles are characterized as incompatible with effective law enforcement, anonymity, the protection of children and secure infrastructure. In reality, good cybersecurity can enhance privacy, and effective law enforcement targeting widely-recognized illegal behavior can protect fundamental freedoms. The rule of law—a civil order in which fidelity to laws safeguards people and interests; brings stability to global markets; and holds malevolent actors to account internationally—both supports our national security and advances our common values.